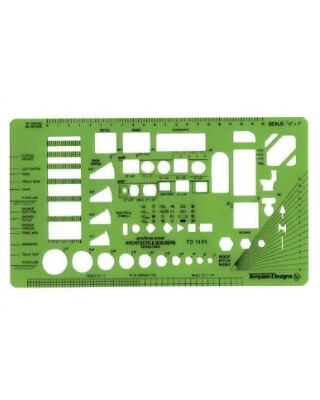 This Alvin Architects and Builders Drawing and Drafting Template works great to help you quick and accurately draw various symbols and fixtures on your drawings. This template works great for residential or commercial architectural design and construction. Contains circles, rectangles, lavatory and kitchen fixtures, roof pitch index, tile layout gauge, door swings, floor elevation indicator, and electrical symbols. Template Size: 5-1/8" x 9-1/4" x .030".